It was a birthday that Santa Clara quarterback Nick Garcia won’t ever forget. His teammates probably won’t forget it either. Garcia celebrated his 18th birthday by helping lead the Bruins to a 26-21 victory over Saratoga at Levi’s Stadium on Friday. He accounted for all four of the Bruins’ touchdowns, three on the ground and one through the air. Garcia helped get the Bruins off to a quick start. The quarterback drove Santa Clara methodically down the field on the opening series. Late in the drive the Bruins needed a clutch play. Santa Clara found themselves facing a fourth-and-10 situation at the Saratoga 19-yard line. That’s when Garcia found leading receiver Richard Corona for a huge 15-yard reception. Two plays later, Garcia ran it in for a touchdown. The Bruins would go up 12-0 on Garcia’s second rushing touchdown early in the second quarter, but the Falcons would claw back. Saratoga answered with a touchdown of their own on the ensuing drive. They capped the drive off with a brilliant pass into tight coverage, just over the outstretched arm of Bruins’ corner Seth Everett. Saratoga would carry the momentum into the second half finishing off another long drive with a quarterback keeper from two-yards out. Just like that, the Falcons were up 14-12. After a Bruins punt, the Falcons had a chance to increase their lead. That’s when the Santa Clara defense came up with a huge play as linebacker Alan Tran forced a fumble. The turnover set the Bruins up with terrific field position at the Saratoga 20. A few plays later, Garcia rolled to his right and found receiver Joseph Hernandez in the back of the endzone to retake the lead, 19-14. After a Falcons punt, the Bruins quickly faced a crucial situation to start the fourth quarter. At their own 25-yard line, Santa Clara converted a third-and-three play when Garcia scrambled for a 30-yard gain. Garcia would finish the drive off with his third rushing touchdown, putting the Bruins up 26-14 with nine minutes remaining. Saratoga soared straight back on the next drive. The Falcons only needed 15 seconds to score on a perfectly thrown, 50-yard touchdown pass, pulling within 26-21. 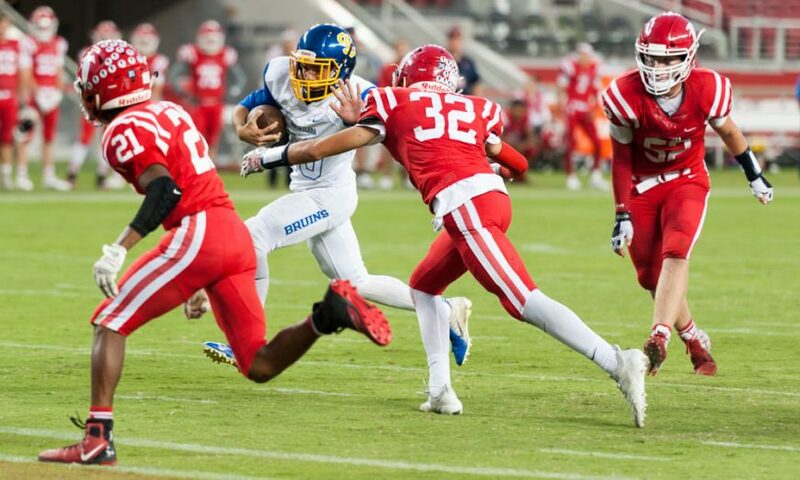 Santa Clara failed to score on their next drive, but a huge 53-yard reception to a wide open Hernandez helped turn the field position in the Bruins’ favor. After a missed field goal, Saratoga took over with 4:06 remaining. The Falcons proceeded to pick up two first downs before Everett got his revenge by deflecting a pass into the waiting arms of teammate Nathan Liu. After the interception, both Garcia and tailback Isiah Ketton helped milk the clock down to under two minutes before the Bruins had to punt the ball away. Saratoga’s last-chance drive would come up short as a fourth-down pass fell incomplete thanks to a strong hit by Corona. Santa Clara will look to improve to 2-0 in league when they host Los Altos on Sept. 28.